The glycoside hydrolases of this family are lytic transglycosylases (also referred to as peptidoglycan lyases) of both bacterial and bacteriophage origin, and family G lysozymes (EC 3.2.1.17; muramidase, peptidoglycan N-acetylmuramoylhydrolase, 1,4-β-N-acetylmuramidase, N-acetylmuramoylhydrolase) of eukaryotic origin. Both of these enzymes are active on peptidoglycan, but only the lysozymes are active on chitin and chitooligosaccharides. No other activities have been observed. The lytic transglycosylases of GH23 constitute Family 1 of the organizational scheme of Blackburn and Clarke . This family has been subdivided into five subfamilies (1A-1E) with Escherichia coli soluble lytic transglycosylase 70 (Slt70), membrane-bound lytic transglycosylase C (MltC), MltE, MltD, and MltF (formerly, YfhD) serving as the prototypes for families 1A, 1B, 1C, 1D, and 1E, respectively. Figure 1. Lytic and hydrolytic pathways of GH23 enzymes. GEWL, g-type lysozymes; LT, lytic transglycosylase. The enzymes of this family cleave the β-1,4-linkage between N-acetylmuramyl and N-acetylglucosaminyl residues in peptidoglycan (Figure 1). Only the lysozymes of this family are capable of releasing N-acetyl-d-glucosamine residues from chitodextrins, and neither catalyze transglycosylation reactions. The stereochemistry of the reaction catalysed by the family G lysozymes has been determined experimentally as inverting . On the other hand, the lytic transglycosidases, strictly speaking, are retaining enzymes. 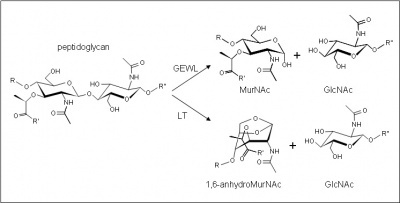 However, unlike lysozyme, they are not hydrolases but rather catalyse an intramolecular transglycosylation to the C-6 hydroxyl group of the muramyl residue leading to the generation of a terminal 1,6-anhydromuramic acid product that is an acetal, and not a hemiacetal . The lytic transglycosylases require the peptide side chains in peptidoglycan for activity, accounting for their inactivity against chitin or chitooligosaccharides . No detailed analyses involving both steady-state and pre-steady state kinetic studies have been reported. Figure 2. 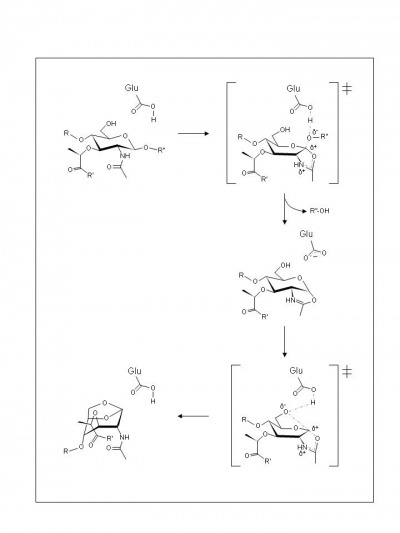 Detailed catalytic mechanism of GH23 lytic transglycosylases. Until recently, the family GH23 enzymes were thought to have only a single catalytic residue at their active centre. The identity of the catalytic general acid/base residue of the lysozymes was first inferred by X-ray crystallography of goose egg-white lysozyme (GEWL) as Glu73 [5, 6]. Likewise, analysis of the crystal structure of E. coli Slt70 identified Glu as the lone catalytic residue. Replacement of each respective residue results in loss of catalytic activity [2, 8]. The mechanism of action of the family GH23 enzymes has yet to be proven experimentally, but examination of crystal structures and theoretical considerations have led to separate proposals for the two classes of enzymes. With the lytic transglycosylases, there is still no evidence for a second catalytic residue at their active sites. Hence, based on the complexes formed with 1,6-anhydromuropeptide  or bulgecin , a two-step mechanism that uses neighboring group participation (also termed substrate assisted catalysis), analogous to the family GH18 chitinases and chitobiases and family GH20 N-acetyl-β-hexosaminidases, has been invoked. Thus, in the first step the Glu73 residue is proposed to serve initially as a general acid to donate a proton to the glycosidic oxygen of the linkage (Figure 2). At the same time anchimeric assistance by the MurNAc 2-acetamido group results in the formation an oxazolinium ion intermediate. In the second step Glu73 acts as a general base to abstract the proton from the C-6 hydroxyl leading to its nucleophilic attack on the anomeric centre and the formation of 1,6-anhydromuramic acid product. The transition states leading to and from the intermediate possess oxocarbenium ion character (Figure 2). For the g-type lysozymes, recent studies support a typical inverting mechanism of action [11, 12] involving general acid and general base residues. It was proposed that two catalytic general base residues, a primary and a secondary residue, position a catalytic water molecule and abstract a proton to effect substrate hydrolysis by the single displacement mechanism. With GEWL, Asp97 and Asp86, respectively, are proposed to serve this function while these would be represented by the conserved Asp101 and Asp90 residues in the g-type lysozyme from Atlantic cod fish. Indeed, the double replacement of Asp101 and Asp90 in the cod lysozyme results in over a 300-fold decrease in activity . Three-dimensional structures are available for several Family GH23 enzymes, the first solved being that of GEWL [6, 13]. The catalytic domain of each enzyme possesses the well characterized α+β "lysozyme fold" for avian lysozymes. However, there are distinct structural differences between the two classes of enzymes. Most notably, the environment of the active site in lytic transglycosylases, particularly around the catalytic acid/base, is more hydrophobic compared to that of GEWL. This distinction may account for the difference in the reaction mechanisms of the two enzymes. Soluble lytic transglycosylase 70 . For g-type lysozymes ; Not applicable for lytic transglycosylases. Inferred by X-ray crystallography of goose egg-white lysozyme . This page was last edited on 26 August 2013, at 12:49.